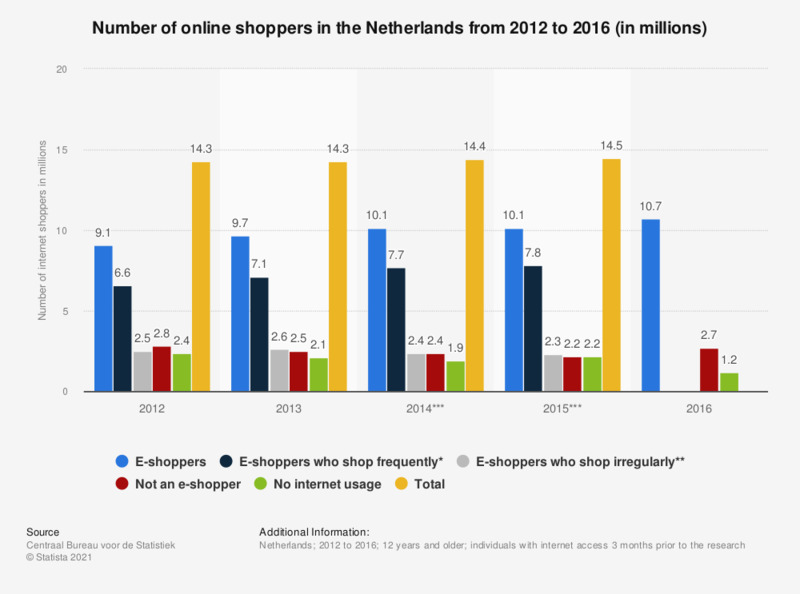 This statistic shows the number of online shoppers in the Netherlands from 2012 to 2016 (in millions). As of 2012, 7.1 million individuals of 12 years and older in the Netherlands, frequently purchased or ordered something online. * Frequent e-shoppers are defined by the source as e-shoppers who have shopped online in the 3 months leading up to the survey. ** The source defines irregular e-shoppers as e-shoppers who have made an online purchase more than 3 months prior to the survey. What support do you use for your Christmas shopping online? Since January, have you ordered CD, DVD and video games online?